In a judgement dated November 3 and filed in Queensland, Justice Kiefel declared a related company, Australis Internet, and World Publishing Systems, had also breached the Trade Practices Act. In addition, he ruled Dataline's managing director, John Russell, was knowingly involved in the misleading acts of all three. Several staff also admitted they were aware of the company's deceptive conduct. El tal John Russell es un buitre convicto y prófugo, buscado por la justicia de varios países, incluyendo la de Guatemala. Mencionado aquí también en el caso del ruso Bitkov. 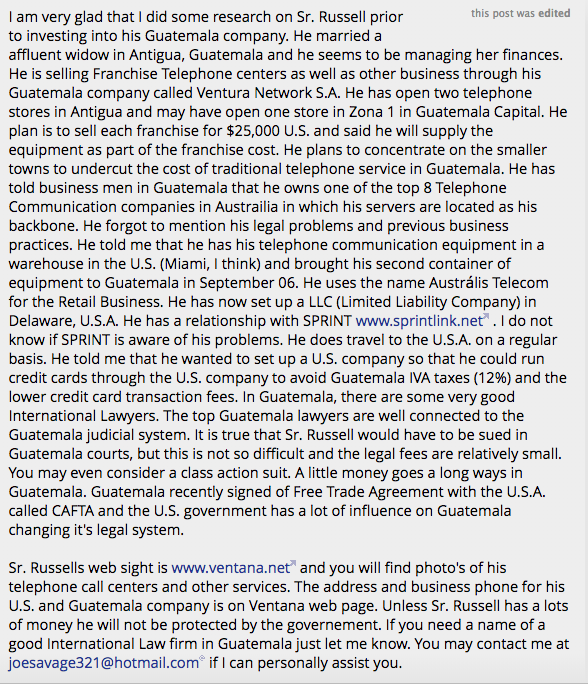 En esto Russell fue sapo y rata, usando doble cara y sacando dinero a los dos lados.